Martin, who was inspired to pursue a medical career by her experience as a Peace Corps volunteer, joined the medical school’s faculty in 1999, and has served in various leadership roles including as interim dean since September 2015. Prior to her appointment as Interim Dean, Dr. Martin served as Executive Vice Dean and Associate Vice Chancellor. She is a professor of biological chemistry and of psychiatry and biobehavioral sciences, and she has been Chair of Department of Biological Chemistry and Co-Director of the UCLA-Caltech Medical Scientist Training Program. Dr. Martin has been a leader in UCLA’s drive to promote cross-disciplinary cooperation among scientists in neuroscience and other brain-related research. 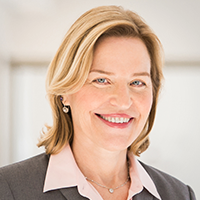 Dr. Martin earned her MD and PhD degrees from Yale, and she joined the UCLA faculty in 1999. Her research focuses on how the brain stores memories. She has received numerous awards, including a W.M. Keck Foundation Distinguished Young Scholar in Medical Research Program Award, the Jordi Folch-Pi Award from the American Society for Neurochemistry and the Daniel X. Freedman Award from the National Alliance for Research on Schizophrenia and Depression. Dr. Martin was elected to the American Academy of Arts and Sciences and to the National Academy of Medicine in 2016.